On November 26, 2002, North American Aerospace Defense Command began receiving reports of a contrail of unknown origin in the air over the Turks and Caicos Islands in the Caribbean. Fighter jets were scrambled from several bases to intercept the unknown that was heading northwest toward the U.S., but reportedly, nothing was spotted. Commercial airline pilots later reported the contrail over Florida and later over Indiana. This fascinating report received scant attention in the U.S. press, which is unusual considering the zeal for "national security" that has been rampant since 9/11. The thought is disturbing that an unknown aircraft could fly with impunity over the United States and receive only a few paragraphs in local papers. What could possibly explain this odd lack of curiosity by the national media? Actually, the failure of the press to respond to this story is no surprise considering that the mainstream press has developed the attitude that UFO reports are strictly for the tabloids. This position has become so pervasive that when some editors and journalists have attempted serious, well researched, UFO investigations, they found themselves isolated by their peers. The popular misconception is that UFOs are seen only by the uneducated, the mentally ill, or hoaxers seeking personal gain. Because of this, many think that any reporter interested in handling such a story must also be so inclined. Heaven help a journalist who has had a personal UFO experience and attempts to report on it. He may face severe questions concerning his credibility as a journalist. There had been some hope within the UFO community that the subject of UFOs would be given fair treatment when ABC ran the special Peter Jennings Reporting: UFOs - Seeing Is Believing on February 24 2005. However, the program had little to do with objectively reporting on the UFO phenomenon and instead dealt more with debunking the extraterrestrial hypothesis, treating the subject as if this was the only explanation for UFOs. For those who have been active over the years in UFO research, the ABC show was just more of the same when it comes to the media's mind-set towards the phenomena. According to the current attitude with the news media, there has never been anything mysterious about UFO sightings; they can all be easily explained away with glib, uninformed blanket statements. However, this has not always been the case. In the late 1940's the mainstream press regularly covered UFO reports. At that time UFOs were a relatively unknown phenomenon and had not been tainted by the "lunatic fringe" that would surface in the 1950's and 60's. By then, most media outlets had become discouraged by the lack of progress in explaining UFOs and little, if any, verifiable evidence. By the time the seventies had rolled around, UFO stories were permanently consigned to the back pages next to the horoscope column. Except for local, small town papers, the news media rarely reports UFO sightings. When they do, the subject is presented as a "feature story," not to be taken seriously. In large metropolitan newspapers, the occasional UFO report that does gets printed is usually restricted to the paper's entertainment section. There has been one recent exception to this trend and that was the November 7, 2006 sighting of a UFO over O'Hare Airport in Chicago. Although it was not until January 1, 2007 that the Chicago Tribune decided to run a report about the O'Hare incident, when the story did finally hit the Tribune's pages, the story was intelligently written with none of the condescending attitude or editorializing that usually accompanies UFO reports. 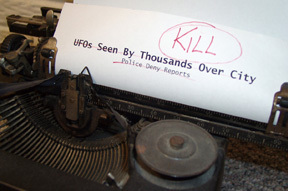 Some journalists have taken on the challenge of serious UFO investigations. Unfortunately, many have suffered setbacks in their careers as a result of their research. Others have been ignored or permanently ostracized. One such journalist, who was not afraid of the stigma of reporting on UFOs, was White House correspondent Sarah McClendon who covered the White House beat for over 50 years. As an independent freelance reporter, McClendon provided a strong and assertive role model for journalists by asking controversial and provocative questions. In 1998, McClendon reported in her newspaper column, newsletter and radio commentary about the call from Ufologists and enthusiasts for government disclosure on UFOs and the establishment of a global scientific conference on the subject. McClendon said, "The lid on UFOs is gradually coming off. There is a national drive to get one million signatures on a petition calling for an open Congressional hearing for government employee witnesses." A March 30, 1998 press release from McClendon stated that, "Unidentified Flying Objects, a term given for many years to unexplained sightings of craft in the skies over every state in the Union, are actual visitors from other worlds, believe a community of scientists and technicians employed by government. "The real danger to the U.S. and perhaps this whole planet is the government has placed such a heavy blanket of secrecy upon this issue. So much secrecy, those in government who have knowledge showing UFOs are identifiable feel the subject cannot be discussed by those in the know without serious repercussions. Others are afraid their friends and co workers will think they are crazy if they even so much as insinuate that UFOs are identifiable as manned craft from outside the earth. This particularly applies to newspaper editors and publishers, reporters and analysts. Thus the U.S. is denying itself the chance to learn more about UFOs or to encourage research despite the fact the United States stands to gain from such discussions." Other reporters have put their reputations on the line by trying to report on UFOs, only to find their efforts unexpectedly thwarted. In a recent article entitled: More Proof Of Media UFO Coverup, reporter Greg Boone recounted his UFO experience while employed at the Poughkeepsie Journal newspaper in New York State. On August 25 1985, Boone, along with 10 other newsmen, received word from a photographer that a huge, boomerang-shaped UFO was slowly flying over the area. The photographer stated that the craft was headed south and it might be visible from the third-floor office windows. The ten journalists rushed to the windows and watched in amazement as a dark shape with amber and red lights and about 100ft above the ground, slowly approached their building. "This thing got HUGE and believe it or not flew right over top of us by about 40 ft," Boone recalled. "It had to be 200ft wide and was jet black." Boone and his colleagues were certain that they had the story of the century. "We had access to AP, Gannett etc. and USA Today which we mainly put out. Nope. Word came down from on high that not one word was to be mentioned. Solid object, hovered, maneuvered, seen by tens of thousands, pictures taken, and no mention anywhere. "He made a big mistake. My high school and college chums were at the bar that night and were just as big and menacing. He was ceremoniously ushered out of the bar by about 3,000 pounds of very angry citizens." Even thought it has been denied, there is no doubt that the military and other government agencies have been responsible at times for press blackouts concerning UFO sightings. 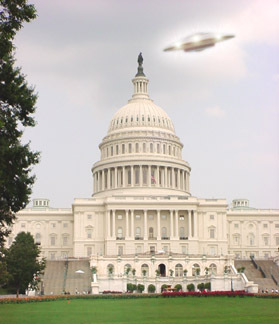 Government orders to silence the press about UFOs are not, however, contained strictly within the United States. In 1996, a top-level BBC executive let slip that there is a D-Notice (black-out) on media reporting of black triangle UFOs. The executive, who has kept his identity hidden, is the former producer of a popular BBC science program. 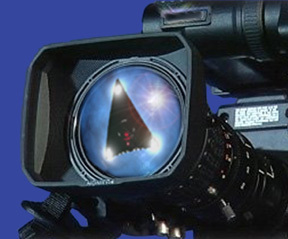 He told one investigator that the black triangle UFO has been "heavily D-Noticed" by the British government. Consequently the BBC will not be reporting on the strange UFO, no matter how many witness reports they receive. According to the former producer, the reason the government has seen fit to slap a restrictive notice on reporting about the UFO is because the government has quietly informed the BBC that the craft is part of a new secret military project and is protected under the secrecy laws. In the United States the press has become "self-policing" when it comes to serious, investigative reports on the UFO phenomena. Rarely will the larger media outlets in the major markets allow anything but the silliest UFO stories to reach the public. On the rare occasion that a legitimate UFO related story does make the headlines, more often then not, the reporter will add personal opinions to the piece in an attempt to save face and invoke the "giggle factor." A good example of this was science writer Lee Dye's July 1, 1998 column on the ABC News web site. Dye's column dealt with the Laurance Rockefeller funded 50 page report that called for reexamination of UFO evidence. The report, issued by an international panel of nine scientists, focused on physical phenomena such as photographs, radar readings and biological effects of UFO incidents and was highly supported by astrophysicist Peter Sturrock of Stanford University. Dye writes that, "No matter how carefully such a report is worded, it can't help but lend credibility to those who claim we've been visited by ETs. That isn't the point of the report, of course, but by calling for better scientific scrutiny of such claims, Sturrock and the other scientists have exposed themselves to the 'giggle syndrome.' The next time he attends a scientific symposium; he can expect a few snickers when he walks in the room. "In interviews with reporters after the study was released, Sturrock said life probably abounds throughout the universe, but 'most physicists believe it is quite impossible to travel from one star to another.' Most physicists? What about him? All he's willing to say is let's take another look at the evidence. OK, but no giggling." Clearly, Dye has interjected his own personal opinions on the subject rather than reporting on the story objectively. This is the real underlying problem when it comes to impartial reporting on UFOs. Many journalists feel that the subject is just "too weird" to warrant real investigation. Instead, most take the low road of journalism and turn their stories into humorous pieces that ridicules everyone involved, no matter how impressive their credentials are. Tom Burch, in his article: Opinions Disguised as News, writes, "The UFO phenomenon is newsworthy and deserves professional news coverage. There are many more angles to the UFO subject than the news media seems to recognize. This in itself is weighty evidence to suggest that the news media is fundamentally ignorant of the facts relating to the UFO issue. For example, the media fails to sense that there is more substance to the UFO controversy than just the question of whether or not extraterrestrials are visiting our Earth. While the answer to this question has a most profound significance to us all if the answer is 'yes,' it is not the only question being asked by UFO investigators." Burch goes on to write that the very persistence of the UFO controversy is newsworthy in itself. "The UFO debate merits news coverage because both sides of the UFO dispute are articulated by highly credentialed spokespersons from science, industry, and academia. Each side in the dispute has something to say. Each side has inherent strengths and weaknesses in its argument. Both the proponents and opponents in the UFO controversy deserve equal time in a public forum, and the American people deserve access to it. The public does have a right to know." To be fair, the study of UFO reports is fraught with problems for the media. In order to present a story fairly and accurately, a journalist must have concrete, verifiable evidence. As any responsible UFO researcher will tell you, solid evidence for the physical reality of UFOs has been hard to come by. Despite the thousands, maybe millions, of UFO sightings over the decades, the evidence that has been uncovered so far has been mostly anecdotal. Even when solid evidence has been brought forward, such as the mysterious metal parts said to be from a crashed flying saucer and sent to radio talk show host Art Bell, there are still many unanswered questions that would prevent most journalists from taking on such a controversial story. Perhaps the time will come when a courageous newspaper editor or national television news director will decide to take the time and effort to conduct a real, objective investigational report on UFOs. Until then, the press will continue to avoid their responsibility by bombarding the public with soft, silly stories about little green men from outer space and the interesting people who always seem to encounter them. Tim Swartz is an Emmy-Award winning television producer and videographer. As a photojournalist, Tim Swartz has traveled the world investigating paranormal phenomena and other unusual mysteries. Swartz is also the author of a number of popular books including The Lost Journals of Nikola Tesla, and is the writer and editor of the Internet newsletter Conspiracy Journal.